62 tournaments have already been played; six more are scheduled around the first and second weekend in August, as the European Beach Handball Tour 2018 comes to an end. 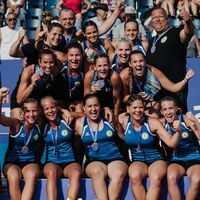 There is double action in Serbia the coming weekend, with the BAP Beach Handball Tournament played on Beach Bager and the APA Beach Tournament played in Gradska plaža Apatin; both events take place from 3 to 5 August. For the BAP tournament a live stream is available at http://sportuzivo.tv/backapalankalive.html. Further tournaments to be played that weekend include the British Beach Handball Championships in Canford Cliffs, Poole, and the Hellenic Beach Tour Finals in Paralia Agias Paraskevis, Greece. One week later, ‘60hours Beach Handball’ in Paços de Brandão, Portugal (Live streaming: https://www.youtube.com/channel/UCcSKL3fZGIQhcAtsuVe-CwA), and the Vespia Beach Event in Visp, Switzerland, (both played from 10 to 12 August) conclude this year’s European Beach Handball Tour which consisted of 68 tournaments. Live streaming will be available from the event in Switzerland via www.ktv-visp.ch. The final ranking will then be available on the ebt’s official website. The best teams of the ebt 2018 will gather again when the ebt Finals are played in May 2019. However, the beach handball season is far from over, as a season highlight, the EHF Beach Handball Champions Cup, which will see Europe’s national champions competing against each other, awaits the fans in Catania, Sicily, at the end of October.